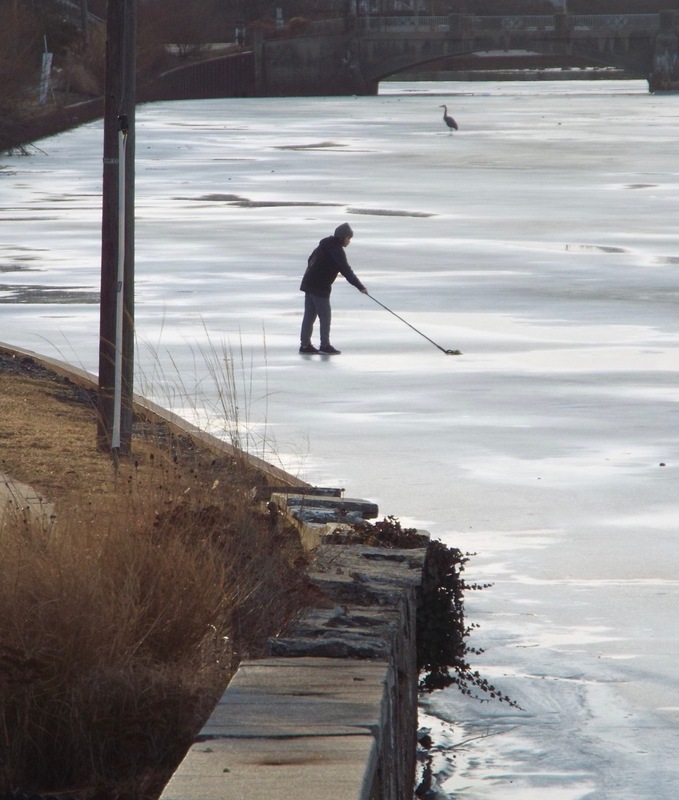 “Today I thought I would take a walk by Wesley Lake. “In the distance, I spotted a huge bird, sitting all alone in the middle of the Lake. I was able to get a close up photo before it flew away. 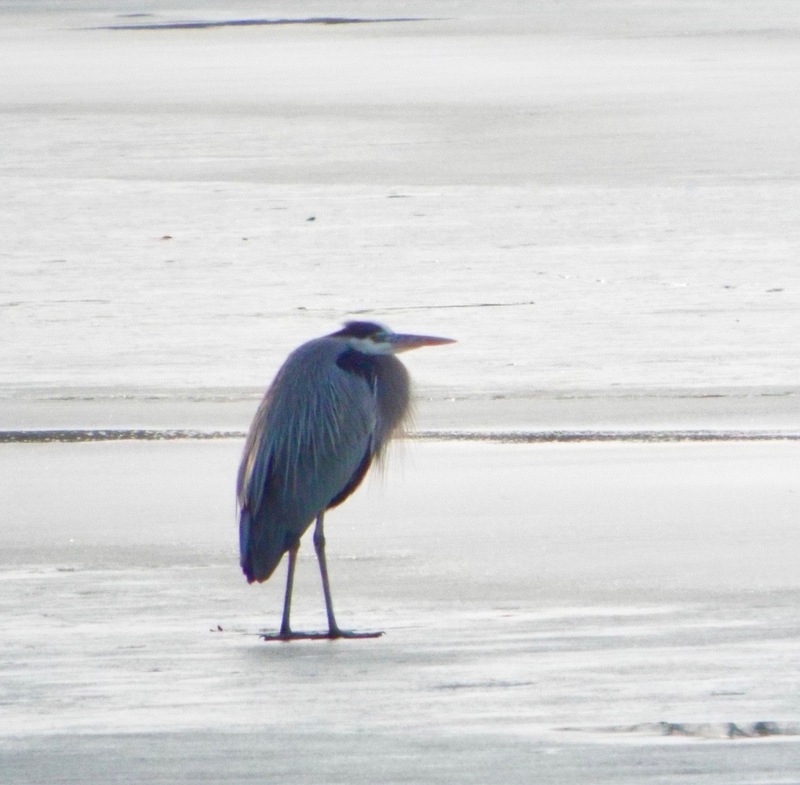 I was told by a passerby, that it was a Great Blue Heron. “She said, , it is ‘Good Fortune’ to see one! Great Blue Heron video from BF. Taken in Ft. Myers, Fla. Ocean Grove beach. by Moe Demby, Blogfinger staff © Click to enlarge. Here is the photo you wanted to be sent of the Muscovy parent and some of it’s chicks along Fletcher Lake. It’s hard to believe that those little yellow “Peeps” will turn into the big white feathered duck. 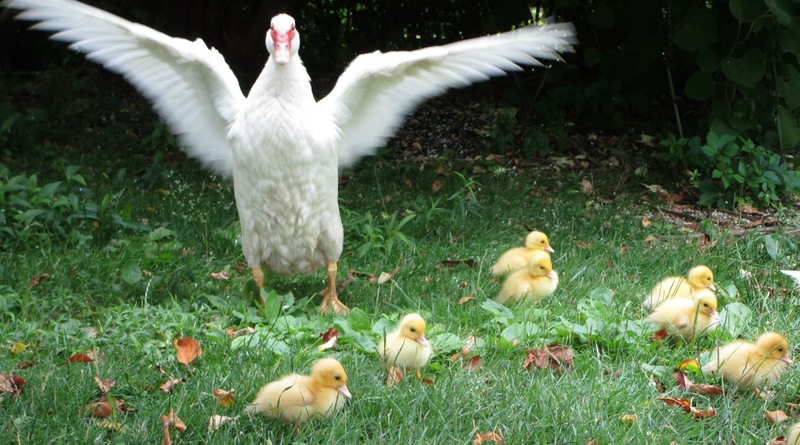 Editor’s Note: Rich has been following the progress of this duck family ever since the ‘Peeps” appeared. The mother duck seems like the bossy type. My favorite duck is the Peking variety skillfully served at the Peking Palace in Manalapan on Route 33. Otherwise, when someone says “duck,” I get under the table. And Rich, if your say “duck”to him, he thinks of marshmallow chicks. Cooper’s Hawk on Delaware Avenue. Paul Goldfinger photo. Dec.28, 2013. Click left to see more hawk detail. Click again for even more detail. When the local birds stopped coming to our backyard feeders several days ago, we suspected a hawk, but we couldn’t see any in the large trees around our yard. 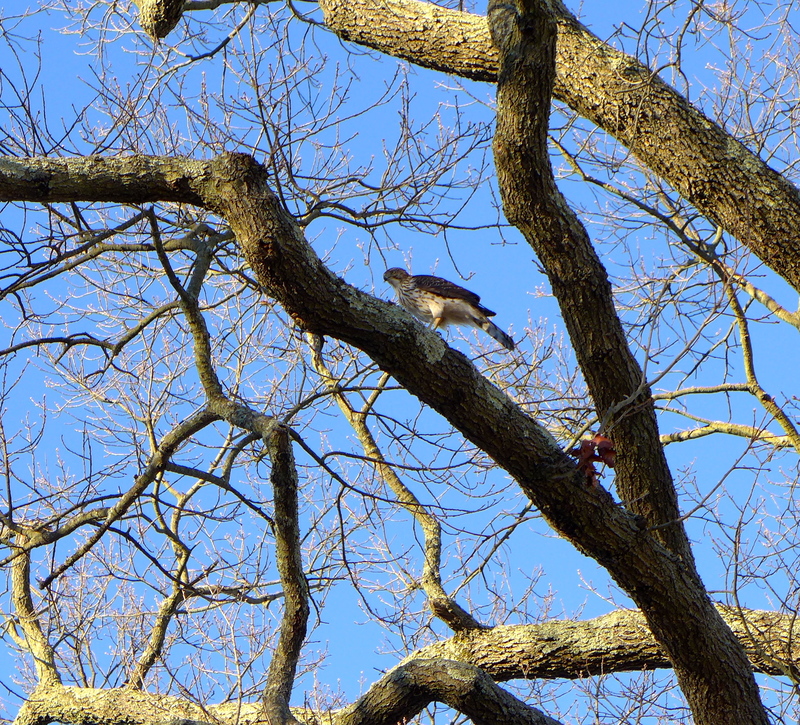 But today we received a call from our neighbor Meredith who spotted a large hawk having lunch in a tree. I was able to get close enough for the photo, but, unlike nature photographers, I don’t have a 400 mm lens to really zero in. He seemed to be chowing down on a small animal, holding his prey with a claw while pulling it apart with his beak. The culprit stayed still for awhile until a large truck rumbled by. Meredith gets the BF Hawk-eye award for today. We’ve been watching backyard birds for many years. We used to live in a semi-rural area in Morris County where there was a large variety of birds to feed and watch. We didn’t think that we would have much luck in OG, but we have seen quite a few interesting birds here. Today, however, we saw a species that we have never seen. We looked into our backyard, and at our feeders were two pair of rose-breasted grosbeaks. The male is black with a startling splash of red in front. They are about 7 inches long. The female is a light tan with white stripes. She is smaller and doesn’t look anything like her male counterpart. These birds are found in Canada and across the US, but they are uncommon in backyards. Something weird was happening today: we also saw four grey catbirds and one male rufous towhee. We also heard a report that someone in a nearby town also spotted the grosbeaks. Let us know if you see any unusual birds in town. Maybe there is something special going on in the bird world. We also heard that there is a vast migration of Admiral butterflies in the area. They are heading north. 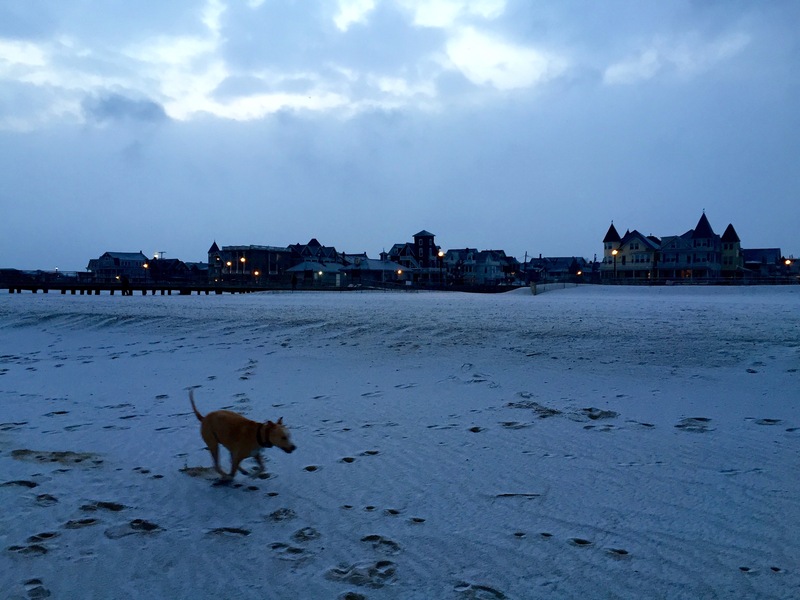 With no ski or snowboarding slopes, toboggan runs or skating rinks, few people choose to visit Ocean Grove during the winter months. (With the exception of Chamber of Commerce events and special Historical Society exhibits.) But several species of birds return year after year. You can see them if you walk by Wesley and Fletcher Lakes. First of all, there are the Brants, small geese that spend most of the year in the Arctic tundra. Unlike our familiar—and larger—Canada Geese, they leave when winter is over, and they’re found now on both of our lakes. Hooded Mergansers seem to prefer Fletcher Lake. These are truly spectacularly plumaged birds: males have a very distinctive white crown, and females sport reddish crests. Mergansers also dive for food, and eat fish as well as insects. They depart for breeding grounds in the spring, moving to lakes as far west as Missouri and as far north as Canada. Try to make a point of seeing these special off-season visitors. And, if you have a chance, drive down Route 35 past the Belmar marina and check out all the swans that winter here. It’s really an amazing sight. But remember: don’t feed the waterfowl.